It’s the classic dilemma of being on a sailboat that has a 80-foot tall mast but needing to get under a bridge that only has a 65-foot clearance. The answer is obvious, right? Just strap some heavy bags to the mast so you bend the boat diagonal so it shortens the height of the ship. Instead of sailing straight, you’re going under on tilt. Duh. 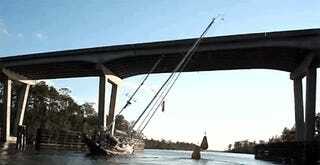 How to get an 80' rig through the 65' bridges of the Intracoastal Waterway using two tons of water. The balls get swung out with an initial turn to port or stbd. The tendency then is for the roll to continue by itself, but is controlled by letting the bags out slowly with a line made off to each bag and running through necessary tackle to a cockpit winch.